A tripartite dialogue was jointly organised by International Labour Organization(ILO), the European Union and International Centre for Migration Policy Development(ICMPD) of Austria, which was held in New Delhi on 26th September 2017. Discussing a range of issues, opportunities and challenges in relations to India-EU Migration and mobility has revealed the nuances of India-EU migration phenomenon. The Dialogue brought together scholars and policy experts from a host of institutes from India and abroad. As shown by evidences, migration and mobility has been increasingly becoming complex in the present scenario. It is the need of hour to create a flexible and better policy environment for harnessing the benefits of migration. The tripartite dialogue emphasised the need for migration management to address the issue of demand and supply of labour involving the EU and India. In her welcome address, Ms Panudda Boonpala, Director, ILO Decent Work Team and Country Office for India observed that “unfortunately there are very less effort to emphasise the positive outcome of migration”. She stated that there are 115 million international migrants today, of which 44% are women. So, gender dimension cannot be overlooked. The dimension of employment is one of the important aspects of decision making process of the migrants. She also observed the demographic transition of the EU and India which is the driving force for migration. EU has shortage of labour force. In contrast, India has an abundant labour stock. Mr. Tomaz Kozlowski , Ambassador of the European Union to India and Bhutan in his opening remarks said, “migration related issues can be better addressed jointly by involving stakeholders”. Dr. D. Mulay, Secretary (CPV and OIA), Ministry of External Affairs, Government of India emphasised the initiatives of Government of India such as Make in India, Skill India, E-Governance to enhance the migration management better. He also stressed the role of diaspora to promote better dialogue in promoting Governmental cooperation. He also reiterated that comprehensive approach is an imperative strategy to address the migration involving India and the EU. Dr. Rajat Kathuria, Director and Chief Executive, Indian Council for Research on International Economic Relations (ICRIER) highlighted on the demographic dividend that India is experiencing in current time. He however, cautions that this phase will be over in next few years. Unless the demographic dividend is utilised, it can be a huge challenge later. He gave the examples of countries such as China, Korea and Japan who have utilised the demographic dividend in the past by investing in education, skill development and benefitted in developing both service and manufacturing sectors phenomenally and finally emerged as global player. Dr. Kathuria observed that employment is decreasing in several traditional sectors and also there is increase of employment in few other sectors such as IT services, Cyber Security/ Data Security, Renewable Energy, Healthcare etc. The increasing proportion of women work force is another important dimension of the migration. He also pointed out that the women participation in workforce has increased GDP in many countries. Dr. Kathuria mentioned that India is now the leading supplier of students to the EU. There is a scope for private investment in the field of Indian higher education, so there is a scope for Foreign Direct Investment. He also observed that factors such as culture, language, accessibility of visa, access to labour market influence the decision to migrate among the Indian students. Dr. Kathuria also argued that there is a need for shaping policy based on insights from key stakeholders, extensive literature review and inputs from international organisations. 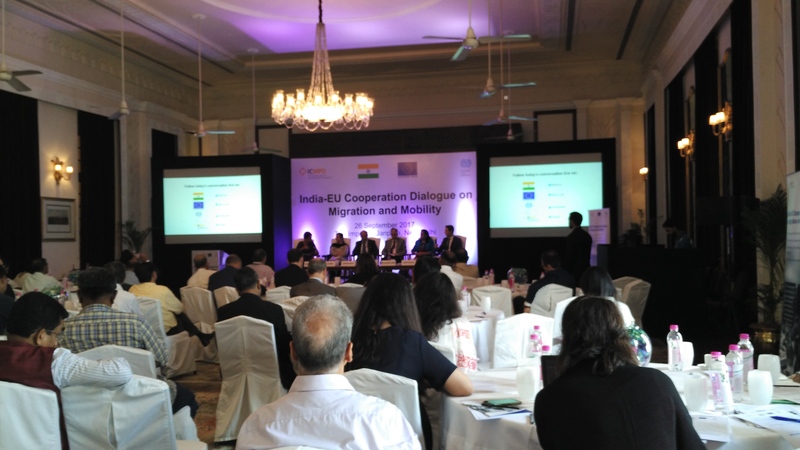 A panel discussion titled “Opportunities and Challenges for collaboration on migration and mobility” was held in the second session where the experts drawn from government, industry and academics participated that was moderated by Ms. Indrani Bagchi. The discussion touched upon the various key issues such as India’s present challenges, India-EU migration, gender, diaspora etc. Followed by, in the question and answer session, Dr. M. Mahalingam, president of Global Research Forum on Diaspora Transnationalism(GRFDT) mentioned that migration is a two-way flow and there is also need for discussion on European migration to India. Though the number is not substantial, yet there are high skilled migrations from Europe to India, mostly employed in Multinational companies. The panel took note of the point. Finally the India-EU Dialogue on Migration and Mobility ended with a vote of thanks proposed by Ms. Sedaf Dearing, Regional Coordinator-Silk Routes, ICMPD.